Team GB team mates, from England, caught me in a moment of weakness at the World Masters Athletics Championships (WMAC) in Malaga. 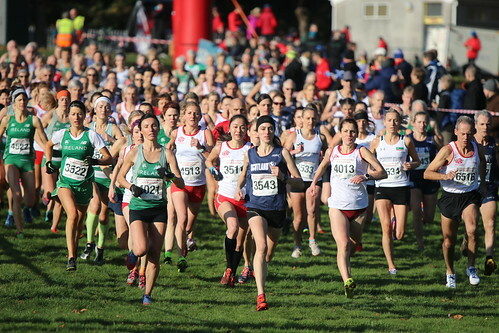 They ganged up and unilaterally decided I should seek selection for England for the British and Irish Masters Cross Country International in Swansea, Wales on November 17. As it turns out I was due to be in Europe for business from October 16 to November 20 so I had no good reason not to. The main challenge to gaining selection was not so much having a solid case. I had just gotten a silver medal at the WMAC in the half marathon and was at the top of the M50 UK rankings for 10K and, afer the Bronx 10 a few weeks later, top for 10 miles. The challenge was navigating the selection process which hailed from a bygone age – post a letter of application with a self addressed envelope. Imagine in the age of driverless cars. So barely two months later here I was crossing the Severn Bridge into Wales with Simon Baines, one of Team GB’s top M45 runners. I had bumped into Simon while running in Richmond Park, with Peter Clarke and David Smith, near the start of my trip and he had kindly invited me to ride with him to Wales. It was a great privilege to be selected to run for England. It was my first time having narrowly, and annoyingly, missed out on selection some years before when I finished 2nd M40 at the BMAF to Ben Reynolds. Unfortunately the stars were far from aligned for this race. Almost 5 weeks into my trip to Europe I was tired, from some 20 flights, out of my routine, out of practice from real cross country racing, and, as I would soon discover, carrying a torn rotator cuff. The injury resulted from tripping in fading light while running on a cycle path on Lake Garda a week earlier. And then there were my ill-fitting spikes falling apart at the seems. They’re now in a Welsh landfill. So I had plenty of excuses not to run but instead chose to use them as excuses for not running well. In short my expectations were low. My main goal was to run hard, ensure I did not hit the deck and excerbate my injured shoulder, and, if possible, finish as one of the 4 scorers. The day started out overcast and damp but then brigthened up such that by the time the race started we were bathed in sunshine. My race was the second of the day. I lined up with male and female runners from ages 50 to 64. I stood alongside Tim Hartley, the race favorite who’d picked up a silver medal at the WMAC for 5000m, and the rest of my England M50 teammates. And then we were were off, sailing down a 400m hill, with 4 laps of 2K to tackle. I had a brief moment of exuberance but then quickly dialled it back. Northern Irish runner Steven Cairns led the charge with England team mates Tim Hartley, Phil Leybourne, and Andrew Leech, who topped the M50 half marathon rankings with 1:11:59, in hot pursuit. This was my 5th outing on the country since 2004. And this course, unlike the one in Boulder I had excelled on while picking up medals at the 2014 and 2015 USATF XC Nationals, was a true XC course. Twisting and turning, continuously undulating, and occasionally heavy underfoot. When I last lived in the UK in the late 90s XC was my forte and I reveled on this type of course. Now I was a novice, running wide, losing traction and steadily losing places. I was overboard without a lfe jacket. Up the creek without a padle. You get the idea. By the end of the second of four laps I had settled into 9th place – behind all five England team mates as well as lead runners from Northern Ireland (NI), Ireland and Wales. The top three of Hartley, Cairns and Leech had a big lead. Over the next lap I consolidated, overtook Welshman Jeff Wherlock, and then started to chase Dermot Hayes (NI), Mark Symes, 1500m gold medalist for M45 at the WMAC, and a fast slowing Leybourne. On the final climb of the final lap, with 600m left, I had all three runners in my grasp but they all proved to have faster finishes. So 8th M50 in 28:06 it was with all five England team mates in front, albeit three of them less than 16 seconds ahead. I was deeply disappointed and dissatisfied even though I had my excuses. Post race I warmed down with Simon Baines, who’d run well in the M45 race, and Tim Hartley. Back at my hotel I sought comfort in bad food and drink and analyzed the race. XC and road are very different. It’s horses for courses and this was not my course. Once a good XC runner I had now totally converted to road. In road races I get into my groove and grind it out. On the country I simply failed to find any groove. A comprehensive suite of pictures by Robert Gale are below. That evening I attended the presentation dinner. England won all categories bar one. I collected a medal, my first representing England. Long overdue. The drink helped drown my sorrows and even got me on the dance floor. Sunday morning I ran with England team mates Stephen Watmough (11th M55), Andrew Leech (3rd M50) and Nick Jones (3rd M40) along the Swansea seafront. A perfect end to a not so perfect trip to Wales.